Last January, news broke that YouTube had signed its first international sports streaming deal, gaining multi-year rights to broadcast the Indian Premiere League’s 45-day cricket tournament worldwide. We’re now closing in on the conclusion of the tournament — the finals begin on Sunday morning — and YouTube has shared some initial stats. 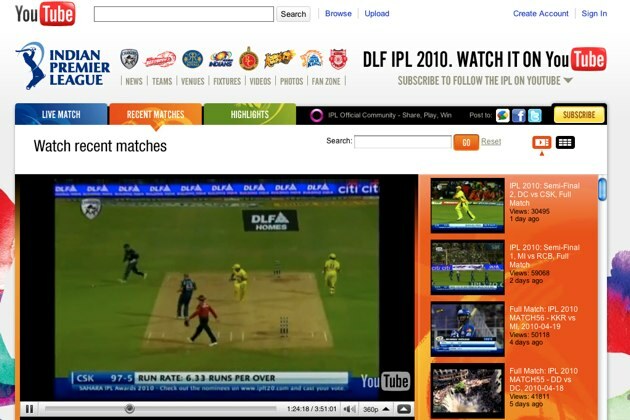 Right now, YouTube’s IPL channel has over 49.5 million views. That far exceeds the company’s internal expectations: we’re told that their stretch goal was to get 10 million views over the course of the tournament. Viewers from 200 countries have watched the streams. Unsurprisingly, India has the most views overall; coming in second is the United States — YouTube had expected that spot to go to the UK or Australia, where cricket gets far more attention. When the IPL deal was first signed it granted YouTube live streaming rights for every country except for the United States, where matches have been posted fifteen minutes after they ended. However, YouTube is streaming both the semi-finals and finals live (we’re told YouTube’s biz dev people worked “around the clock” to make that happen). All of which means the final view tally is going to be way more than 10 million.